The Variations command is a simple and easy feature. It is designed to remove prevailing color cast and to restore the natural hue and saturation balance of an image. Variations (Image > Adjustments > Variations) is easily Photoshop’s most straightforward color adjustment command. One of the things that you’ll like about the Variations feature is that it will present you with a collection of thumbnail previews for previewing the color corrections rather than previewing it in the main image window (the usual case with other color correction methods). You can preview as many color options as you like before applying it on the actual image. Open the image and as usual, duplicate a new layer > Bike. When you are done selecting the bike, go to Path Layer > Ctrl+Click on the layer to select the path. Next, Ctrl+Shift+I to invert the selection (so you could make changes on the bike instead of the background). Once you are there, Variations will show you a sizable dialog box that enables you to do basic color and lightness modifications using preview images. You will be able to make changes to the shadows, midtones and highlights of an image through the appropriate radio buttons at the top of the dialog box. The slider bar labeled Fine on the left and Coarse on the right will allow you modify the intensity of your edits. 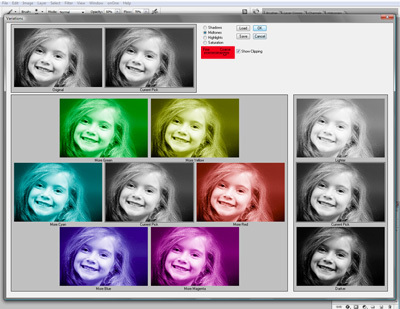 Select the Midtones option for general color modifications. Other options like Shadows anHighlights are seldom used but feel free to experiment with the possibilities. Next, select Show Clipping to indicate whether an area of the picture “clips out” from overlightening. It is recommended to use this feature whenever you are using Variations. Start applying the different Variation effects for as many times as you wish till you achieve the results you are looking for. Here, I want change my bike from green to purple. To achieve this, I would have to click 2 times on More Magenta, 3 times on More Red, 1 time of More Cyan and 1 time on Darker. These variation effects will add onto itself as you click and will be shown in the Current Pick thumbnail. Apply layer mask to erase areas of the image which are not supposed to be affected by the color change. Brush Opacity 100% will be perfect in removing unwanted colors on these areas. A lower opacity brush on the other hand will help lighten the current color, without totally erasing it. Merge the layers when you are done. If you want to experiment with different “background” variations, just follow the above steps. Mask out the bike but do not invert the selection as it was told in Step 2. Remember: If you mask the bike, and invert the selection, you will be making changes on the bike instead of the background. Lastly, always mask out any areas which are not supposed to be affected by the color change. Change Grayscale to RGB by selecting Image > Mode. Go to Image > Adjustments > Variations. Like what I mentioned earlier, the slider bar labeled Fine on the right and Coarse on the left lets you modify the intensity of your edits. You will see the difference between Fine and Coarse as I apply both the effects here. In Coarse, you will get a pop-art effect – the mood and changes will be more drastic and emphasized. Just click on the different Variation effects till you achieve the results you are looking for again. If you liked our tutorial, feel free to share it with your friends or even bookmark it!